September 2013 – Happy. Healthy. Heathen. Here’s the catchall post, where we look at things that didn’t really fit into the other topics, or that I just didn’t get to. Let’s review. If you are feeling good, and don’t have excess fat, and are sleeping well, and have the energy you need to do whatever it is that you do, and your medical markers for health – blood pressure, cholesterol, triglycerides, etc – are all within healthy parameters, and your body parts are doing what you require of them, and you recover from injury the way you’d like, Congratulations! You are healthy! Keep doing what you are doing! And I’m really not being snarky when I say that; I really mean it. There’s enough variation in physiology and disposition and habit to account for a wide variety of experiences in nutrition and fitness results. How to begin? There are a couple of approaches. One thought is that any improvement will benefit your health, and therefore if you start small, by changing one nutrition habit a week, incorporate one new rule at a time, you will be more likely to manage a lifestyle change that you will stick with. Another idea is to go all in, whole hog, the full monty in one big step. I’d like to suggest a hybrid of the two. Go all in – for 30 days. Do a little research, hit up some of the websites I’ll add links for, pinpoint a starting date for sometime this week, plan your shopping day before you begin, and then do it. Go grain-free, sugar-free, grass-fed meat, scads and scads of veggies, a little fruit, healthy fats — for one month. Don’t look for 30 days 4 months down the line when you won’t have a wedding or party or trip – that ain’t gonna happen. Do it now, in spite of the wedding, party, or trip. Just commit – it’s 30 days! But don’t cheat! Not one cheat day or cheat meal or even cheat bite – full-on clean eating for 30 days. Then at the end of the 30 days, reevaluate. Are any of those markers better? Feel better, sleep better, work better? Lose a little fat? Focus a little better? After that evaluation, have a little sit-down with your bad self. Decide if it’s worth it. If the answer is no, have another little sit-down, because it should be. It’s your health, folks, the only body you’re gonna get. And for those of us on the backside, evolution is not very nice to us. Once we’ve passed those child-bearing years, nature is kind of over us, so to speak. You’ve gotta give back a little, and this nutrition is exactly the way to do that. Another point I want to make is that there is more to Paleo living than just nutrition, although nutrition is a major part. There’s movement, which is a whole other series of posts, but I’ll link to my favorite sites where you’ll find info from the experts. There’s footwear, which is a surprisingly big deal since it affects our posture which affects our digestion and skeleton and muscles. There’s play, and community, and sleep, and a whole lot more! I want to quickly touch on managing life swimming upstream. How to handle the pizza, pasta, cake, ice cream, donuts, pancakes that surround us every minute of every day? Here’s what works for me (most of the time): Making these choices of what to eat are no longer dependent upon willpower, like other calorie-counting-based diets. When you are empowered with the information of what foods are healthy and what foods are not, your choices are based on reason, education, and logic, and that beat the hell out of willpower! One of my dearest besties has had such a recovery of her health eating cleanly, that she says she can’t even bring herself to eat those former treats and temptations. That’s the power of good nutrition! The next little mini-lecture is about the time and money it takes to eat this way. Yes, it takes more money to buy grass-fed meat and local produce. Yes, it takes longer to chop and prepare all those veggies, and it’s a whole new way to cook, which has a learning curve. A. When you’re not buying all the other crap, it’s actually better than even, depending upon how much interior-grocery-aisle shopping you’re currently doing. B. Eating should be an event. The instant availability of food is what has gotten us where we are in the first place! I have learned to love this part. I have these beautiful clear stacking containers and when they are full of colorful veggies all chopped and ready, it makes me joyful! Plus, the weekly chopping task goes well with a partner jamming out in the kitchen after a bike ride to the farmers’ market and back! This is Protein Power. It’s a husband and wife MD team who have been nutrition physicians for years. Theirs was the first book I read on my journey, so even though other blogs are more active, I have huge loyalty to them. This is Mark’s Daily Apple. I met Mark in Atlanta in August at the symposium. His blog is active, and he has great freebies at his website, including several free ebooks. His site is a great resource for the fitness piece of the lifestyle. Here’s Robb Wolf’s site. Robb is one of the Ancestral Health rockstars. I got him to sign his new book and chatted with him for a while. He gave several presentations and was interesting every time he spoke. Here’s Dr. Peter Attia. Peter is the most brilliant physician I know. I visit his blog, and understand about 20% of what he posts. Check out this TED talk he gave. Here’s The Clothes Makes The Girl. Melicious! You will love her! This is Nom Nom Paleo. She posts a lot of family-friendly recipes, and she’s great! Here’s PaleOMG. More great recipes, with lots of funny commentary. Here’s Paleo Parents. They do lots of creative stuff because they have 3 little guys, so lots of lunch box foods and treats. Now, back to law school, farm living, traveling, and kids! Thanks for reading, both this post, and the whole series! The posts up til now present information that you have heard before: cut out grains and sugar, consider dairy carefully, eat lots of veggies and high-quality protein. This has been at least on the periphery of mainstream for several years. What you don’t read so much about is the idea of healthy fats. Keep in mind that our approach is still about eating foods that make us healthier and create a good physical response, and not just because our ancestors may have eaten some version of it. Also keep in mind that this is going to presented highly simplified, and from a nutritional layperson. My interest in nutrition is personal (and professional related to my personal training practice), and I am influenced not a small amount by application and implementation to my own body. First let’s identify what fats create a good response in our bodies. You probably already know there are different kinds of fat that have to do with the chemistry of the molecules. 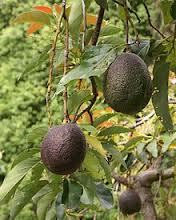 Monounsaturated fats (MUFAS) are good guys that improve blood pressure and lower cholesterol – olives and olive oil, avocados (and oil), macadamia nuts, hazelnut oil. Then there are the saturated fats (you read correctly). Don’t freak out! Those 2 words – saturated fat – have been unfairly blamed for effects that have usually come from the nasty bun/french fries/onion rings/bread/pasta/your-choice-here that accompany that fat. Here’s a link to an abstract – read the conclusion. Healthy saturated fats include clarified butter (an exception to the dairy rule since clarified butter is the fat only, with the milk proteins removed), pork and beef fat with this caveat: Remember that when choosing meats, it’s pastured-meat all the way. Toxins can accumulate in the fat of animals exposed to antibiotics and chemicals, and if you’re not eating grass-fed, cut off or don’t eat the fat. 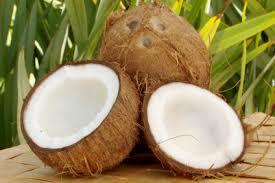 Another saturated fat is coconut oil, coconut meat or flakes, and coconut milk. It’s great for cooking, and the milk can be used as a substitute for cream in sauces and coffee. The flakes make a killer coating for chicken tenderloin, and as a topping for salads, and for a straight-up snack. Then there’s the PUFA’s – the omega 3’s and 6’s you’re hearing so much about. We want both of these fats in our diet, but we want the right ratio too. 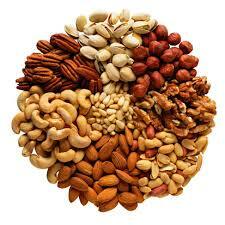 Good sources of omega 3’s are cashews, hazelnuts, and macadamias. However, it’s common and easy to overeat nuts – they’re snackity delicious, terribly handy, very portable. Part of our whole foods effort is that food preparation and consumption SHOULD be an event, and take a little time and effort and thought. The concept of “grabbing and going” has so much traction in our busy culture, and it works against our healthy eating. So here’s the piece I mentioned in an earlier post. Bear with me, same disclaimer as always: amateur’s understanding. Your body always uses a combination of fat and carbohydrates for fuel. When you feed your body an abundance of sugar, that’s the fuel your body will use, leaving your stores of body fat unburned and in place. When you withhold sugar, and provide enough healthy fats, your body will burn fat for fuel, leading to fat reduction. (We also use different fuel for different levels of activity – higher intensity burns more carbohydrates, lower intensity more fat). You can take this to full-on ketosis , which is the point when the body turns almost exclusively to burning fat for fuel in the absence of carbohydrates. I met Dr. Peter Attia over a full-cream latte in San Diego a couple of years ago and he’s an absolutely lovely man. He is so much smarter than anyone I know, and while I loveloveLOVE his blog, I very seldom understand it all, even with this effort to make it accessible to non-scientists. Here’s his post about ketosis and carbohydrates– it’s worth a read, but bring your brain. But first, watch his Ted talk, and bring a tissue. This is the last of the substantive posts. That is it. It’s how I eat most of the time. It’s what I think the science guides us to eat. It’s what I think the precepts of evolution drive us to eat. I’m going to write a wrap-up post with some remaining details and how I manage eating in this manner. This has been a fun series for me, and a fantastic distraction from the Brief I’m working on for Legal Writing. In continuing our title alliteration, this is the Protein Post. 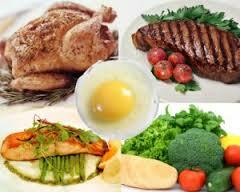 There are 3 types of nutrients we eat: carbohydrates, fat, and protein. We’ve already covered most carbohydrates, we haven’t yet discussed fat, and now we look at protein. Protein by definition is any of a class of nitrogenous organic compounds that consist of large molecules composed of one or more long chains of amino acids and are an essential part of all living organisms, esp. as structural components of body tissues such as muscle, hair, collagen, etc., and as enzymes and antibodies. What that means to us is that because protein is found everywhere in our bodies, we need nutritional protein to survive. Protein is found in animal products (muscle meat, organs, dairy, eggs,), in beans, nuts, seeds, tofu, and some grains (quinoa). The focus of this post is to discuss the best sources of animal protein, and is not the debate about eating animal protein at all. That’s an important and interesting and relevant topic that I promise to blog about at another time. It has been said that You Are What You Eat. Michael Pollan, the author of Omnivore’s Dilemma, takes that one step further and says: You Are What You Eat Eats. So there is a point to be made that all that corn and grain our commercial livestock are being fed are showing up on our table after all. And if we’re trying to eliminate that, we’ve just had a huge setback. But there’s so much more important a reason not to eat grainfed meat (I’m talking about ungulates now – cows, pigs, sheep). These animals have not evolved to eat grain in the manner that our American meat industry feeds them grain. It makes them sick, and necessitates their being on antibiotics most of the time they are being fed grain. Grain causes rapid weight gain, which of course increases profits, but puts the animal in an extremely unhealthy condition. And of course, all this unnatural food that makes them sick causes them to suffer. As much of an advocate of health I am, this suffering should be a much greater motivator than our personal health. If we are going to eat meat, finding animals humanely raised, humanely slaughtered, and naturally fed should be a goal all of us should strive for. The fact that they make us healthier should be a secondary concern. The book I mentioned above, Omnivore’s Dilemma, is one of the best resources for becoming educated about the status of this portion of our food supply. Because so many folks have found better health through a more natural approach to eating, it is likely that you can find a supplier of grass-fed, humanely-raised, local, pastured animals. Whole Foods tries to use local suppliers, and uses a number grade to reflect sustainability. Hit up your local farmers’ market – even rural Murfreesboro has 2 grass-fed animal farmers, who provide both beef and pork. You can also easily find pastured chickens’ eggs, since even back-yard chicken farms produce an abundance of fresh eggs. Or you could investigate the wonderful world of raising hens yourself! They cut down on the bug population, they aerate the grass, they provide eggs, and if you don’t get Foghorn Leghorn they’re not really noisy – just a little proud clucking when one lays an egg. Wild game is a good choice too, as are wild-caught fish and seafood. Contrary to most folks’ perception of Paleo, it’s really not massive amounts of protein. Today I had one 6-ounce piece of tuna, and a couple of eggs – the rest was fat and vegetables. Some days I have a little more, most days about 60-80 grams of protein. 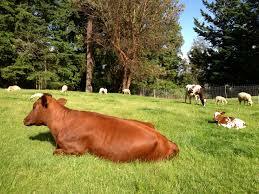 In the next post, when we discuss healthy fats, we’ll also address the importance of pastured animals. When I first began to eat this way, I considered this a 2nd or 3rd tier issue – if I’m eating good protein, eliminating grains and sugar, eating my vegetables, do I really have to go to the effort of finding and buying grass-fed meat?? I’ve come to the conclusion I was wrong about that. I think this is a high priority for our health, for reasons we’ll get to in the next post!